• Final Fantasy 6 – (also known as Final Fantasy III for the US SNES version) is a role-playing video game developed and published by Square for the Super Nintendo Entertainment System. Released in Japan in 1994, it is the sixth title in the mainline Final Fantasy series. Despite being released in the US as FF3, the version we were given had a sloppy translation, censored images/sprites, and a slew of localization issues. This version includes a revised English translation and restored images which had previously been censored for the US market. 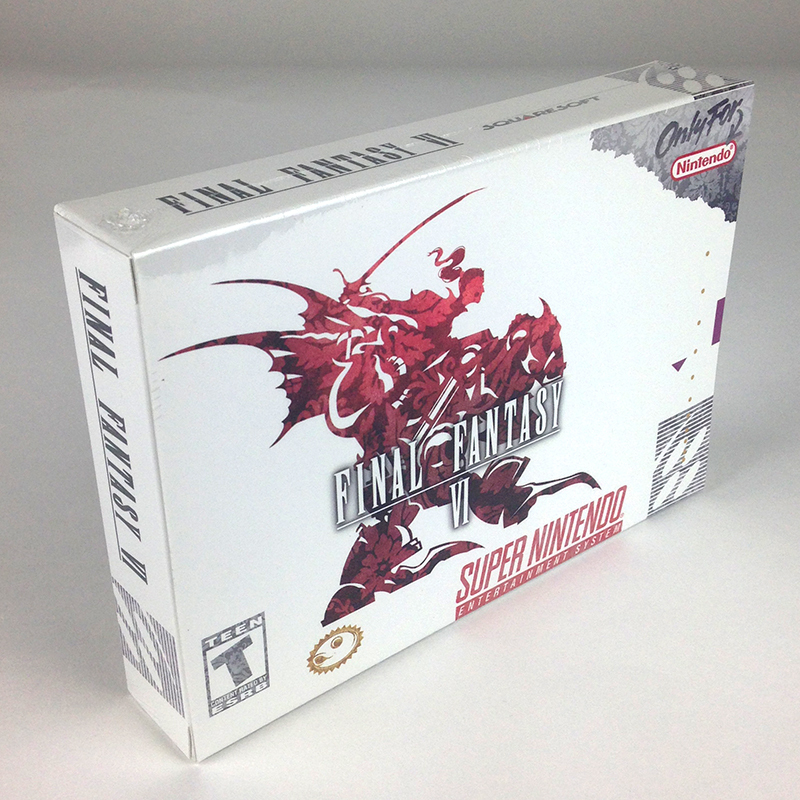 Like previous Final Fantasy installments, Final Fantasy VI consists of four basic modes of gameplay: an overworld map, town and dungeon field maps, a battle screen, and a menu screen. The overworld map is a scaled-down version of the game’s fictional world, which the player uses to direct characters to various locations. As with most games in the series, the three primary means of travel across the overworld are by foot, chocobo, and airship. With a few plot-driven exceptions, enemies are randomly encountered on field maps and on the overworld when traveling by foot. The menu screen is where the player makes such decisions as which characters will be in the traveling party, which equipment they wield, the magic they learn, and the configuration of the gameplay. It is also used to track experience points and levels. Combat in Final Fantasy VI is menu-based, in which the player selects an action from a list of such options as Fight, Magic, and Item. A maximum of four characters may be used in battles, which are based on the series’ traditional Active Time Battle (ATB) system first featured in Final Fantasy IV. Under this system, each character has an action bar that replenishes itself at a rate dependent on their speed statistic. When a character’s action bar is filled, the player may assign an action. In addition to standard battle techniques, each character possesses a unique special ability. For example, Locke possesses the ability to steal items from enemies, while Celes’ Runicability allows her to absorb most magical attacks cast until her next turn. Final Fantasy VI takes place on a large, unnamed world. During the course of the game, its geography and landscape change due to various developments in the game’s plot. In contrast to the medieval settings featured in previous Final Fantasy titles, Final Fantasy VI is set in a steampunk environment.